March has been a busy month for us and it’s not over yet! 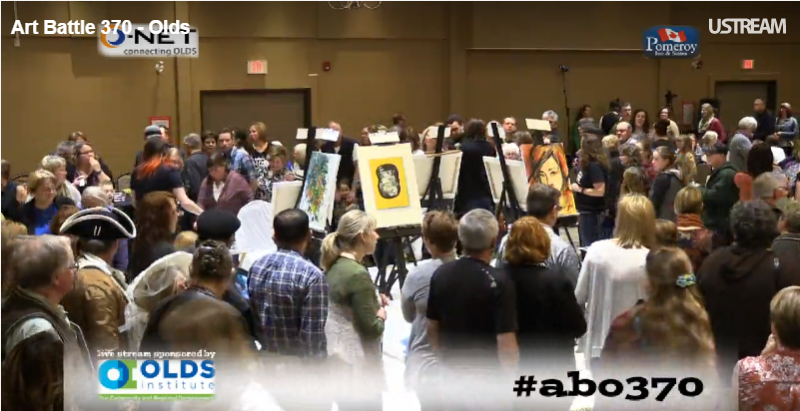 On March 19th we live streamed the Art Battle #370 Olds event from the Pomeroy Inns & Suites at Olds College. This third annual event out grew the Olds Legion and moved into the banquet room at the Pomeroy. Art Battle is a national event in Canada where artists paint for a specified time and the audience gets to pick the winner via a peoples choice vote. What makes the event so interactive is the party atmosphere and the ‘slow tornado’ of viewers who encircle the group of painters during each round of the battle. This year they sold out at 325 tickets. Added into the mix was some live music from three local talented musicians. All kinds of art and culture going on in Olds this Saturday night. We were contracted by the Olds Institute who sponsored the live streaming broadcast of the event. Thanks to O-NET the community owned GigaBit broadband provider for supplying the bandwidth which allowed us to stream in 720HD. This setup included the most number of cameras we have ever had covering an event. Two operator cameras, two fixed and a wireless remote hand-held camera. We also projected the live feed onto a big screen which turned out to be a great hit with the audience. At the other end of the hall we projected a “Twitter Wall” of tweets with the event hashtag of #abo370. I have to admire one of our crew who brought in his 10 foot tripod and stood at the top of a ladder to get some great shots of the room including the painters. The big hit though was the wireless roaming camera. It allowed us to get in close to the painters without dragging a cable behind the operator. This would have been a serious tripping hazard for the ‘slow tornado’ of onlookers who surrounded the painters as they battled it out on the risers. After the first round of the battle, we received a request from a few members of the audience to get shots of each painting that they could view on the big screen to help in their decision on who to vote for. This was also a great help for those folks who had limited mobility and couldn’t join in with the mass of people encircling the painters during the battle. Audio was a combined feed from the sound board used for the emcee and musicians and a live room mic. Since our command centre was out in the open it gave folks a chance to see what we were doing and we had many visitors. There were a few times when I forgot about the open mic and it picked up the occasional conversation between me and a curious visitor. The total number of live stream viewers was just under 100 with most from Canada and a few from the US. BTW: it was a fun evening and I really enjoyed listening to the live musicians. They jammed out a few tunes and it gave me something to listen to and enjoy during switching the camera views. The action wasn’t as fast as a hockey game but directing five cameras and three audio sources kept me busy.